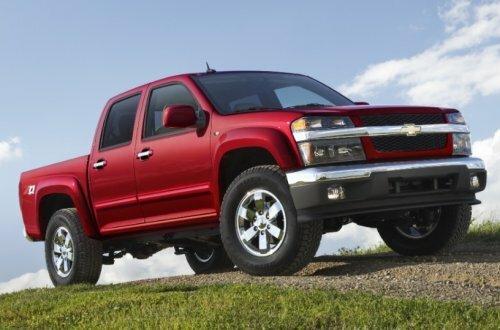 The National Highway Traffic Safety Administration has announced a new recall for select General Motors midsized pickup trucks over a concern that these vehicles may have not had the secondary hood latch installed during assembly – possibly allowing the hood to come up while the vehicle is being driven. This new GM midsized pickup recall pertains to the 2010, 2011 and 2012 GMC Canyon and Chevrolet Colorado trucks built between November 9th 2009 and August 28th 2012. There are as many as 118,000 affected pickups in the United States with another 15,264 in Canada, 7,492 in Mexico and 4,872 exported to other various global markets for a total of 145,628 trucks included in this recall around the world. In these 2010-2012 GMC Canyon and Chevrolet Colorado pickups, the secondary hood latch may not have been installed during the assembly process. The secondary hood latch is the item that you have to manually trigger by sliding your hand under the hood (or through the grille in some other models) once you have pulled the hood release inside of the vehicle. Should the primary hood latch that is controlled by the interior level fail – or should the driver pull that level accidentally thinking that it is the parking brake release – the hood will come up once the vehicle has gotten up to speed. In a vehicle that is properly equipped with the secondary hood latch, when that interior lever has been pulled to open the hood, the secondary manual latch will catch the hood and prevent it from opening while driving. However, if the primary latch is released and there is no secondary latch, there is no “maybe” about the hood coming up. The force of the air blowing through the grille and over the top of the vehicle is more than enough to lift the hood a bit and once the air going over the vehicle catches the leading edge of the hood – it opens quickly, usually slamming against the windshield. In the best case scenario of a hood-up situation that is made possible by the new GMC Canyon and Chevrolet Colorado recall, the hood will swing up and make it impossible for the driver to see where he or she is going. Sometimes, slamming on the brakes will be enough force to make the hood come back down so that the vehicle can be pulled out of the way of other vehicles but I have seen hood-up situations where the impact of the hood slamming back bent the hood so badly that when the vehicle came to a stop – it stayed up against the windshield. The worst case scenario is that when the hood slams against the windshield, it shatters the glass and shoves it into the cabin. With that, not only is it impossible for the driver to see where he or she is going but now, they also have broken glass spraying into their face. Having the hood blow up is just plain bad. Luckily, there have been no reports of any accidents or injuries stemming from this hood latch recall with the Chevy Colorado and GMC Canyon but with the elevated risk of an accident and the fact that these midsized pickups do not comply to Federal Motor Vehicle Safety Standard # 113 pertaining to Hood Latch System – GM is making the quick call to get these pickups back to dealerships. The automaker expects to begin contacting owners on or around January 17th 2013 at which point owners will be asked to return to their local dealership. While there, a technician will inspect the vehicle for the presence of a secondary hood latch and if one is not present, the dealership will replace the hood with one equipped with the crucial latch. This work will all be done free of charge and owners who are worried about their vehicle being affected can inspect the vehicle themselves. If you can pop the hood from the interior and then lift the hood without triggering the secondary latch under the hood – you might want to call your dealership right away. Owners can also contact Chevrolet at 1-800-630-2438 or GMC at 1-866-996-9463 in reference to GM recall campaign number 12319. Most vehicle hoods end at least 6in from the base of the windshield and open wide enough that the driver can see through the lower part of the windshield even with the hood up. Your best-case scenario sounds overly dramatic. Your worst case is blown even more out of proportion. Modern vehicle windshields don't shatter! Granted, your scenarios may combine to spider-web the windshield so badly the driver can't see. I had this happen when I hit a deer on the freeway that bounced into my windshield (didn't come through), but I was still able to safely get to the shoulder and stop.